The Late Late Show with James Corden (also known as Late Late) is an American late-night talk show hosted by James Corden on CBS. It is the fourth iteration of The Late Late Show. Airing in the U.S. from Monday to Friday nights, it is taped in front of a studio audience Monday through Thursday afternoons - during weeks in which first-run episodes are scheduled to air - at CBS Television City in Los Angeles, California in Studio 56, directly above the Bob Barker Studio (Studio 33). It is produced by Fulwell 73 and CBS Television Studios. Corden was announced as the show's new host on September 8, 2014, succeeding Craig Ferguson. Originally scheduled to premiere on March 9, 2015, CBS later pushed back its premiere to March 23, 2015, in order to use the NCAA basketball tournament as a means of promoting Corden's debut. 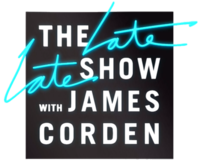 This webpage uses material from the Wikipedia article "The_Late_Late_Show_with_James_Corden" and is licensed under the GNU Free Documentation License. Reality TV World is not responsible for any errors or omissions the Wikipedia article may contain.